Collage Mania is about to start! I hate that what do you do question as I have often wondered how to describe my various creative activities. How do you describe yourself as an artist? One moment I am doing one thing that could be described easily as Art and the next I am doing something else that is craft! One moment my curiosity has lead me to to look at something quite strange as beautiful like the mould that grows on food in the fridge and the next I am looking at something most people would find familiar and boring and finding it fascinating like the bubbles in the washing up water. Have you noticed that the term maker is being used to describe the activity of various people who may in the past be referred to as crafts person, or applied artist? For instance the British Crafts Council provides some interesting and thoughtful reading but in the Makers in Focus which looks at the working environment of West Midlands people producing crafts, the term ‘maker’ is used to encompass practitioners who variously describe themselves as craftspeople, or applied artists. One of the ways I try and make sense of what I do is by defining what ever it is, as clearly as I possibly can. I think most people do that. The way I see it is if you can’t talk about what you do, or haven’t taken care in how you think about what you do, how do you expect others to respect the way you spend your time? Or how do expect people to respect what you make? Once again I came up with it by using ColourLovers and the palette was inspired by a crazy quilting block ( below). Remember that the colours can only ever be a suggestion as computer screens display colours differently. The aim is to be as close as possible to the colours on your screen. From ColourLovers you can download swatches to use is Photoshop, Illustrator, or in a CSS file. Have fun with it! If you are wondering where the idea for the swatch came from it was this block and request for some pink that provoked the colour scheme. Once again click on the image and it will take you to a larger image. As usual when you have worked the idea swing back to this page and leave a comment with blog or flickr address so that people can take a look at what you have been working on or done. There is a flickr group for the Take it Further Design Challenge and Debra Spincic has set up a another TIF blog. Please remember if you use Debra’s tif blog to swing by here too! You can see it http://threadsacrosstheweb.blogspot.com/2008/07/may-tif-finished.html“ rel=”nofollow”>here. Here is my May TIF I was trying to show the overlapping areas of my work and my identity and use a kind of venn diagram idea. Finally got some photos up of my progress with May TIF challenge. They are on my blog but not up in Flickr yet. I’m having a love/hate relationship with internet commerce. My stores are eating up all my internet time and I don’t get as much time to participate here as I used to . 🙁 Maybe I’ll find balance someday. I have finally finished my challenge piece for May and posted it on my blog (http://sewingmagpie.blogspot.com) and on the TIF Challenge blog. I’m just returning to the TIF after a very busy couple of months and have collected my fabrics for May & June. Hope to get them done soon. My May challenge piece is on my blog and on the Take It Further blog. It has been a busy two months, hopefully I can get back in the swing of things for June! Explanations at the sisters site. I’ve posted my May challenge piece. It was a really thought-provoking challenge, I enjoyed it very much. Sharon, I’m a great admirer of yours and I’d really like to join in the fun (when a slot becomes available) — great inspirational work from your followers! I am finished too and it is up on my blog. I found the color scheme this month to be irresistible. I am so excited to see what everyone has done! Done. will put up on my blog –I did resort to the color bar–that was really a challenge for me as I do not do pastel colors. I have just posted my May challenge piece, I really wanted to throw it in the garbage but decided to finish it “warts and all”. I’m just getting my head around calling myself an artist; haven’t concluded how to describe it yet. Another last minute finish. This month was much harder than I thought it would be! I’ve finished my piece this past week! Picture is in my blog, as well as the flickr TIF group. Finished my piece for May. Wow, that’s cutting it close. Still don’t know what to call myself though. I have just osted my take in this months TIF. Hope you enjy reading my 2 pence! In by the skin of my teeth! Just a note to let folks know I’ve posted pictures of what may become my TIF piece for May on my blog today. I’ve spent too much time doing things other than stitching this month! I just published my May TIF at my blog http://fiberartmusings.blogspot.com/ Hope you like it. I interpreted both concept (what a doozy!) and palette. I add my congratulations on stitchin’ fingers, Sharon. I’ve not had a chance to get onto it much, yet, but now that the May piece is finished, I may have one or two days to look around a bit. Looks like a few of us got done today… whew, 3 days left to boot. I made a postcard entitled “Winging It” using the color theme. It’s getting harder and harder to do both the color and thought theme! PS.. Sharon, Your Baby, Stitchin’ Fingers has taken off well, congratulations on your awesome endeavor! I’ve posted my challenge and my story on my blog. For the may challenge, I made a little crazy quilt using the indicated colors. I will be late with this month’s challenge. I gave up sewing this month because I was in occupational therapy for carpal tunnel and radial nerve problems. The therapy is over so I starting to sew again 3 days ago. The plan is to hand quilt a block that will be uploaded to a new blog banner. I’ve really struggled with this month’s question, what do I call myself and why? When I quit my job nearly 4 years ago, I faced the same challenge when people asked me what I did…as if being a wife and a mom was not enough. One kid is in college now and the other’s nearly there so what am I when I’m no longer a “Stay at Home Mom”? I did set a goal for myself then to design and teach hand embroidery and I’m just starting to reach that goal. I’ve written a tutorial for the Focus on Finishing blog http://focusonfinishing.wordpress.com/2008/05/16/treat-bag-tutorial/ and I taught my first paid class this month. Maybe someday I’ll feel comfortable calling myself a designer or a teacher…for now, wife and mom is just fine with me. I have been sick for the past month & I still can’t see the end of it. So I did the concept. Squeaking in under the wire here, I think I would define myself as a listener. Through the decades, that seems to be the role which serves as a springboard to making positive contributions to those around me and the community at large. It’s only taken a life time of training by the universe to teach me to listen. I haven’t made any progress on the piece, but I’m envisioning a calm, monochromatic blue field of color, with varied values, perhaps with a vase or vessel or some sort stitched simply in a running stitch or outline stitch. That’s it for May, although I hope to get the piece actually up on the blog before the 31st! I just finished the May challenge…photos are on flickr and the story is on my blog. Yeah ! I am finished with May’s piece. http://zquilts.blogspot.com. I really thought I might not finish this one in time. Phew! I used the colors again in the May challenge. It’s part of a collaborative project tho, and I can’t post a pic until everyone has finished. When I do post it, I’ll come back and leave a comment. I’m posting my finished purse for this month’s TIF. My TIF in may is finished and posted on my blog. I have posted my May piece on my Blog, in Flikr and on the TIF Blog as well – one has to cover all bases!! I have posted my May piece on my blog. Still have a ways to go. Sharon, I done my May TIF all is on the blog and the April TIF is a wip! Morning glories and the gorgeous May colors in silk ribbon! I thought it was still the first week in May. Oh dear. Allie’s latest crazy quilt got me going!! I haven’t finished April’s and I’m going to have to bail on May’s at this point too as I’m having to pack up house and studio and shift from Adelaide to Brisbane!! So I’ve ended up with a stash cleanup but I’ve still got truckloads!! I will try to have something to post but things are a little crazy at present. Love the new stitch fingers forum. Life is getting in the way, and I will have to do my May TiF challenge in June… Sorry about that! Wow, was that ever a challenge to come up with some way of illusatrating this month’s’ theme! I could put my thoughts into words, but it took ages to come up with a plan for putting them onto a cq block, LOL. Hi again Sharon I forgot to put my blog address on the previous post and I also forgot to sign off–too much going on in my head I think. I have finished my May challenge piece–thought I had better get a move on seeing as I have been spending a bit too much time looking at the Stitchin Fingers Group stuff. I just to publish one design “Mayo” I like very much this palette by colours!! hope you like it. I’ve got the preliminary thinking for the May challenge finished and now to start doing some of the bits for it. I have posted my thoughts on the May theme challenge on my blog http://maggies-textiles.blogspot.com . I am still thinking about hte colour challenge. Hi, I know I am very late but my TIF piece for March is on my blog now….April and May will follow soon…. Adding to morning glories, the evening primroses and Allie’s gorgeous work to inspire a new needlepoint crazy quilt design in the works! I am making some progress with my May piece. I hadn’t been stitching for some time and I missed it. To me it is so restful, it gives me the opportunity to come down. Next week I will go to the hospital with my son whose eye will be operated (just a small operation) and this is a wonderful project to take with me. Yes! I made progress on this May challenge. It will probably be finished before I complete my work on the April challenge. Hi Sharon I have posted my CQ pieced square for May on my blog now on with the embellishing. I’ve been brooding on this for a while and will blog about it when the idea gels. I don’t really like labels but if I’m being facetious I would say that what I am is a botanist as that’s my day job (and much more). Describing my involvement with art and textiles is mostly about process. In the book I co-authored as part of my work I put in a dedication to my parents who encouraged me to observe and interpret the natural world – this applies equally to my artistic endeavors. im not sure how to translate onto cloth! I finished the TIF. I made a bag for my daughter. I used colors. I am trying to do something, but not sure you can really call that progress. All of your works are so wonderful and inspirationa, I’m visiting lots of blogs even when I don’t have time to comment, keep going, all of you! I will probably use the colors for all months. April is pieced and May is thought about. Want to see my progress on Tif May, too? See http://miekenoor.web-log.nl/mijn_weblog/2008/05/progress-on-tif.html. I love to reed an d see the progress of the others, too. What a different ways you can go with this challenge!!! I did try to write this just now, I wished I had saved it as it doesn’t seem to have entered in the line. Oh well, just to say that my challenge is done for May. My first thoughts about this challenge are now posted on my blog. I have purposefully not read other responses before writing this. Another month and another great challenge. Read about my initial thoughts on the challenge for May on my blog. I may not be able to complete a piece this month since I’m getting ready for that cross country move the first week of June, but yesterday I dyed some fabric which I MIGHT use on the piece for this month’s challenge which I will complete as soon as I can. I’m planning either a garment, likely a jacket, or possibly a clergy stole (since I’m a minister) that reflects the nomenclature I’ve chosen of Fiber Artist/Theologian. Some of my best fiber/textile pieces have been in biblical interpretation so that name seems appropriate. My May TIF is finished, its a bit odd and not like my last ones but as i will be away for a while i wanted to get it done. Really got me thinking. there are two posts on it one after the other. Thanks for another great topic Sharon! unfortunately, this is the first and the last update for TIF this month, I am away for a three weeks holiday and I have the piece finished when I come back.So no updates in the mean while! I’m BACK. I hope I’ve not been banned for dropping out to move this old bag of bones and tons of books and fibers an hour north. This month’s challenge is a no brainer as to identifying myself. I’m an embroideress. Yes I may study and incorporate ideas from lots of disciplines, but my greatest pride is that time when I can put the needle to the ground and just do a workmanlike job of embroidering something. Now how I’m going to interpret that in embroidery is not yet quite clear but I have a few ideas. Watch my blog for progress. Hi there, I found this challenge easier than I thought. I have outlined the way mine is going on my blog if you would like to read about it. I will post the finished piece quite soon. This palette is very different! I’ve got musings over at my blog but no ideas yet…. I’m definitely doing some soul searching as I strive to define what this current phase of my life is. How do you keep coming up with themes that land so close to my home??? First thoughts on my blog. I had to skip April, life in the way. I think I will be using the colors again, finally some I absolutely love. Not sure if I will do some embroidery or quilting. By the way, thank you for the thought-provoking theme, Sharon! Pretty colours this month Sharon. I’m going to be late though as I have a lot of work due by the end of the month. Hope to get May’s challenge done in June. I’m going with the colors again, as planned. 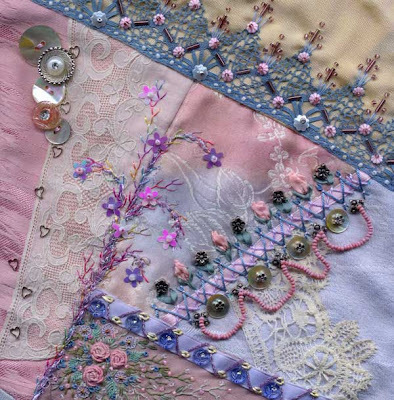 I’ve got my crazy quilt block on Flickr. Now the fun begins!! Thanks so much Sharon, for both the May Challenge and for accommodating my request for pink! I’ve matched up DMC floss colors to your palette and posted it on my blog. I’ll talk about my theme for the concept in the next couple of days. Although I’ve mulled over the difference between “craft” and “art”, so as to defend myself mentally against the attacks of some of my high falutin’ teacher friends, I’ve never felt much need to answer the question of “who” I am in the fiber world. (Very important question in other areas of life though) I think the “why” of stitching is much more relevant question. Anything that consumes many precious hours of my week should be of value, and my hours with a needle bring relaxation, joy at seeing a concept take form, unstressed mental activity, and occasionally even a finished product. I’ve never felt a strong need to identify myself with a label but then I have a career that I tend to use as a public label when one is needed and I’m not out there working to exhibit or promote my handwork/needlework/fiberart/whatever. Long ago when asked I came up with “I make things” and that has stuck most. I think in a way I gave up trying to get others to understand what it is I do and why so I just have ignored the issue. Last week I was at the Embroiderer’s Guild of America Great Lakes Regional Seminar in Madison, Wisconsin and the keynote speaker at dinner was a quilt artist–a lovely woman whose name I have totally forgotten, for which I must apologize. She showed her progress in her quilting and designing over many years. But she began her talk with a discussion of how she identifies herself. Her interesting take on it is that she is “recovering.” She’s recovering from being afraid to call herself an artist (she’s not quite there yet in her own mind), she’s recovering from not taking her work seriously, she’s recovering from guilt at taking time to stitch rather than clean/spend time with her family/do laundry, etc. There was a lot more to it but it was an interesting twist on the issue. I just posted my reasons for referring to myself as a textile artist on my blog. It remains to be seen how I’m going to interpret it all visually! Judith: I really like your description of “maker of stitched textiles”. Sharon: You are really making us think once again. Obviously this is a timely topic and theme. ‘Can’t wait to see how everyone depicts it. Oops, sorry for all the typos. I have posted a few comments. Unfortunately my schedule has prohibited me from participating in this year’s challenge. I wanted to respond to the “makers” label, which has now transferred to distinguish those in the visual arts. The new term is “object makers,” which defines those who still use their own hands as opposed to those who pay fabricators, or those who are in the growing ephemeral categories such as performance, video, media and time arts. I rather bristle at the label frankly. But on that note of changing label and definitions – in the new Sculpture magazine the first three articles are on artists who could be said to be Fiber artists, as opposed to sculptors. I had noticed a growing trend in the last five or so years of placing artists whose large-scale work use incorporates techniques and process that are typically used in fiber applications, suchas wrapping, sewing, weaving, tying, in the Sculpture category – interesting indeed. The artists in the May Scupture Magazine are inorder of appearance: Cathy de Moncheux, Andrea Loefke, and Anne Wilson. I have my choice for this and last month on the blog! I describe my quilting work as ‘fibre art’ or fabric art. An artist described it as ‘fine art quilts’. Because I have always loved to sketch and paint, I describe myself as artist. Q: What do I call myself? the term “Textile artist” covers a lot of things … so I tend to use that one a bit, seeing I dabble in a lot of creative things, and most of them are textile related. I got mine finished and posted early this month for a change. I combined it with my Fast Friday Fabric Challenge. Wow! what a thinking question this one is! I have tried repeatedly to past my finished April TIF links on your April TIF post comments. All I get is an error page that says “discarded”. I notice that other people don’t seem to be having a problem commenting. I call myself a maker of stitched textiles. “maker” … because it locates me in the larger community of those who work in ceramics, metal, wood, etc., with the commonality of using the hand to translate inspiration into a tangible object. “stitched textiles’…because it is a broader term than embroidery and gives more emphasis to the ground material. I’ve posted some initial thoughts on this topic on my blog. Again, you’ve given us much to mull over. What wonderful colors you selected for this month’s challenge. I uploaded a chart for everyone to use – if they’d like – shading from dark to light. The chart is on my blog at http://www.dianem.wordpress.com Enjoy everyone!!! Ah, Sharon, you once again hit the nail… I even deleted my “About” in the blog since…I found it so hard to describe myself. So, thank you once more for this challenge and the challenging questions. I will face them this month. Well Sharon, I’ve read this May-challenge twice and I still don’t feel any bubbles coming up. “What do you call yourself and why?’; I think I have to chew on this for a while…I haven’t thought about this before, always doodled around and doing as I please around my workingtable. Sometimes traditional quilting, sometimes wonderfully experimenting with all kinds of techniques…maybe I want to blend those two together in time, I don’t know…thank you Sharon my mind’s beginning to crack ;-), I’ll show you all with what I manage to come up with! I know what I call myself… explaining why might be a little more difficult to articulate. Hardest of all will be to portray it visually!!! This may be the month that I cop out and do the color challenge! You have chosen another topic to make us think Sharon and I love those colours! I’ve just joined your Studio Journals course and I’m determined to make the time to do all the work. Artists and Morning Glory colors! I call myself an artist who sees and paints morning glories. More later. How did it get to be May 1? I was just thinking I could set aside another project and get my April (not to mention March) blocks done in time. So, I was surprised to see the new guidelines. I do like this new color scheme – I have admired that block before. Maybe I should post the unembellished blocks so you know I’m still thinking about Taking it Further. This time I will go for the colour option and try my hand at canvas stitching. In ten years of stitching I never had a needle case. I think it is time to make myself one. Oh my goodness, I may have to resort to the color bar this time. However the pastel palette will be a challenge for me, We will see —Will use the next hour while I walk, to see what my brain can conjure up. Wow Sharon! What an interesting question! I will post my first thoughts on my personal blog so as not to fill your comments page too much. Hmm Sharon, this is a hard one, I used to call myself a cloth doll maker, then I knitted, but that wasnt art, then a textile artist as that covered a multitude of things. Mixed media artist? Actually I dont think I am an artist at all, but I do get cross when people use the term craft in a rather derogatory way, after all you spent years becoming a craftsman in the old days of guilds and a Master Craftsman was indeed some one to reckon with. Artists seem to think they are above craftsmen, but most of those only dabble in paint! I do this too but I dont think I am an artist. I think more thinking is required. Love the colors this month, Sharon, and the theme is one I’ve been thinking about for some time now. What DO I call myself? This is going to take some real work to depict from a design perspective. I’ve been scratching my head over this question for some time now! I am doing a lecture on May 20 about “what do we call ourselves” : quilter, quilist, art quilter, fiber artist, textile artist..and yikes I have not done the notes for it yet !! Thanks for more grist for this mill ! And the May challenge question is one that is always on my mind. Maybe I can finally put it into some focus. Challenge question is thought provoking, this is something I will have to think about. I love the colours, was hoping for something light to brighten up after all the rain. Pink is not my favourite colour to work with so using that will be a challenge in itself. Need to finish April first not much left and will post to flickr soon.